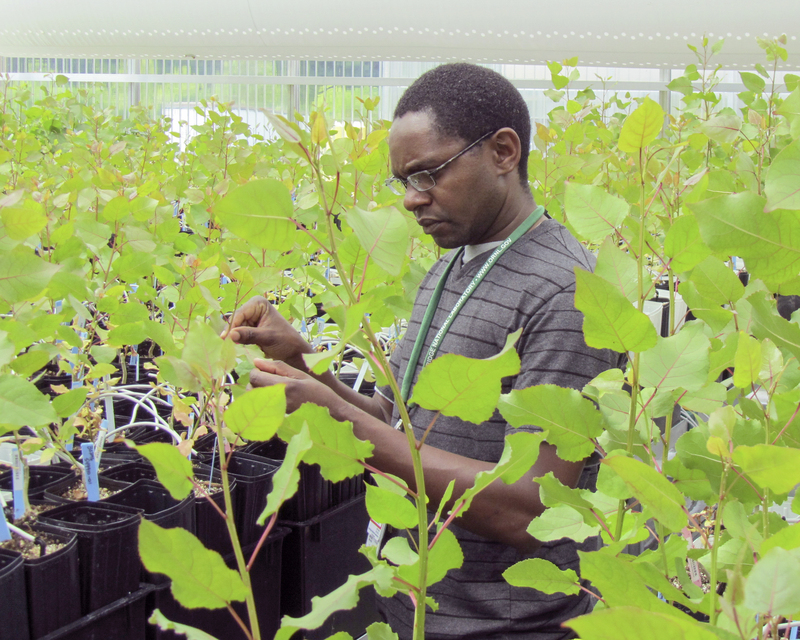 ORNL lead inventor Wellington Muchero and his team studied natural genetic variants of poplar trees with lower lignin content that best benefits ethanol production. 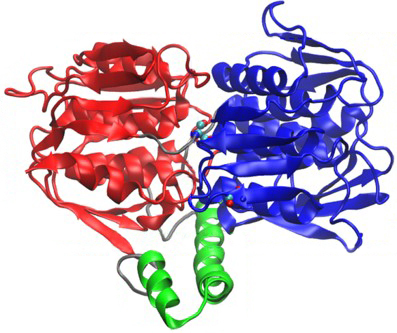 An ORNL-led team discovered the new plant protein (represented in green) responsible for regulating lignin biosynthesis that showed an increase in sugar release of up to 280 percent, resulting in the 250-percent boost in ethanol yield. 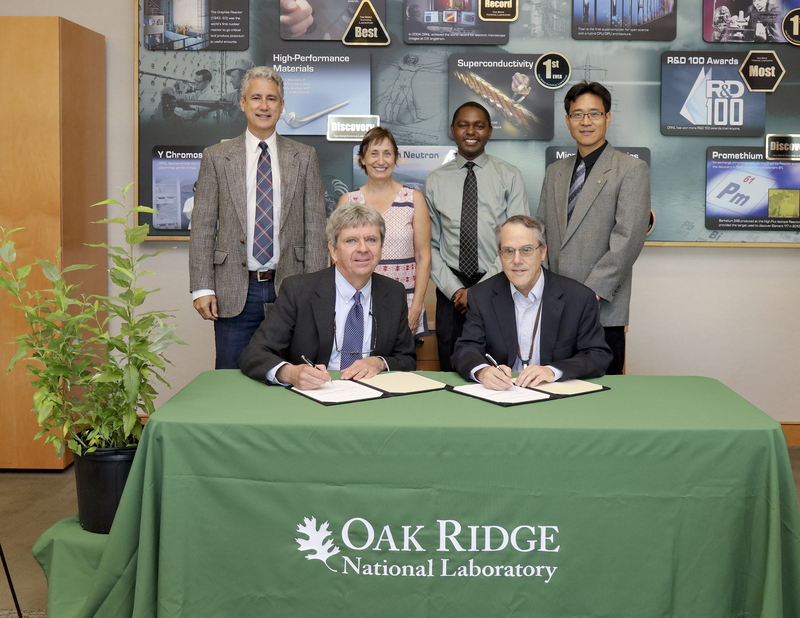 Brian Stanton, chief science officer of GreenWood Resources, and ORNL's Science and Technology Partnerships director Jim Roberto signed an agreement to license ORNL's invention to boost biofuel production. The ORNL-led research team, including Gerald Tuskan, Lee Gunter, Wellington Muchero and Jin-Gui Chen, will continue to study the low-lignin content producing plant gene in GreenWood’s commercial varieties. OAK RIDGE, Tenn., Sept. 23, 2016 — GreenWood Resources has licensed an Oak Ridge National Laboratory technology based on the discovery of a gene in poplar (Populus trichocarpa) that makes it easier to convert poplar trees into biofuels. “What sets this discovery apart from similar studies is that this technology represents a 25 to 50 percent reduction in lignin content with a single gene, and the plants are still healthy, which is quite remarkable,” said Thomas Zacharia, deputy director for science and technology at ORNL. Previous research in poplar (often selected because it grows quickly) and other biofuels crops has typically shown between 5 and 10 percent reductions, often resulting in plants that performed poorly in field tests. Founded in 1998, GreenWood Resources, Inc., is an integrated global investment company focused on the development and operations of forestry assets with operations in North America, Latin America, and Europe. GreenWood’s core competencies —capital investment management, forest science, forest operations and sales and marketing— address the broad skills required to produce superior, risk-adjusted return for investments into intensively-managed forestry assets. Learn more about GreenWood at www.greenwoodresources.com.